On February 20, 1942, Edward H. O'Hare of VF-42 flying a Grumman F4F-3 Wildcat shot down five G4M1 bombers within minutes of each other. The F4F-3 Wildcat was Grumman's first monoplane fighter and despite being outclassed by the Mitsubishi Zero, it was a surprisingly successful US Naval fighter of WWII. Although inferior to the Zero in speed, rate of climb and maneuverability, its mediocre performance was compensated by a strong structure, superior firepower, and internal protection for the pilot. The early Zeroes lacked self-sealing tanks and armor for the pilot and a few shots from the Wildcat’s 0.50 caliber guns could easily bring one down.1 American pilots also developed tactics such as the "Thach Weave", to minimize the advantages held by Japanese fighters. The XF4F-1 (Grumman G-16) never went further than the drawing board..
For Grumman, the handwriting was on the wall and the new design was the shape of things to come. 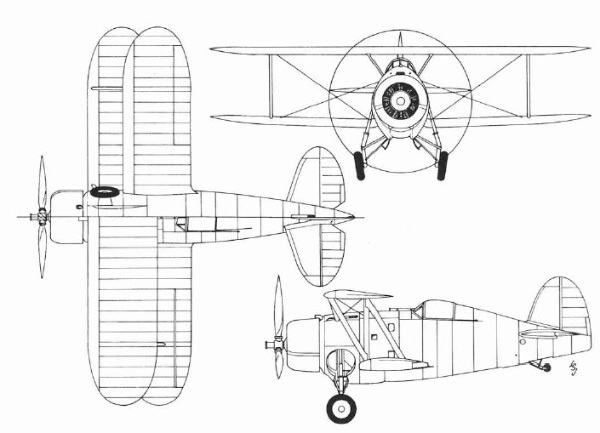 The XF4F-2 was a cantilever mid-wing all-metal monoplane, with fabric covered control surfaces, and had a gross weight of 5,535 lb (2,510 kg). The wing employed the newly-developed NACA 230-series airfoil capable of a maximum speed of 290 mph (466 km/h). It was powered by a 1,050 hp (780 kW) Pratt & Whitney R-1830-66 Twin Wasp with a mechanically-driven, single-stage, single-speed supercharger, driving a Hamilton Standard constant speed propeller. As installed in the previous biplane fighters, the XF4F-2 had the same unique retracting landing gear, operated by a hand crank requiring thirty turns.3 However, a slip of the hand could result in a very serious wrist injury. Fuel capacity was 110 gallons (415 liters), located beneath the cockpit, with a 20 gallon (75 liter) reserve tank behind the pilot's seat. Armament consisted of two 0.30 caliber guns in the fuselage and provisions for two 0.50 caliber machine guns in the wings, or two 100 lb (45 kg) bombs beneath the wings. • Grumman XF4F-2, 290 mph (466 km/h). • Brewster XF2A-1, 280 mph (450 km/h). • Seversky XFN-1, 250 mph (402 km/h). • The Buffalo handled better than the Wildcat. • The Twin Wasp engine was more complicated than the Cyclone engine. The Brewster Company was awarded a contract for 54 production F2A-1s, but the X4F-2 showed enough promise not to be discarded entirely and Grumman began work on a new prototype, the XF4F-3. The XF3F-3 (Grumman G-36) was created from the XF4F-2 prototype, but the only original portions of the aircraft that remained were the fuselage (lengthened to 28 feet), and the landing gear. 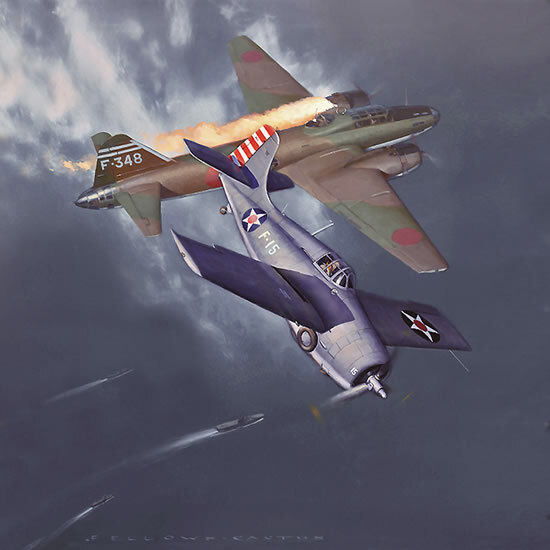 The wings were lengthened from 34 feet to 38 feet with squared off tips—the blunt tips were not only characteristic of the F4F, but would become typical for most Grumman aircraft. The wing area was increased from 232 to 260 sq. feet, the empennage section was redesigned, and the gross weight was increased by 600 lb. It was powered by a Pratt & Whitney, XR-1830-76 engine, driving a Curtiss Electric propeller. It is considered to be the first fighter aircraft in the world fitted with a two-stage, two-speed supercharger, although this engine had been tested in the Vought XF3U-1 in 1935, and the Douglas XTBD-1 in 1936.6 The first flight was on February 12, 1939, and achieved a speed of 333.5 mph at 21,300 ft. Despite major engine cooling problems, the potential of the aircraft was clearly established. Deliveries of Buffaloes were slow in coming and by the end of 1939 only eleven aircraft were delivered to the US Navy, because Brewster had concentrated more effort on exports than on domestic orders. 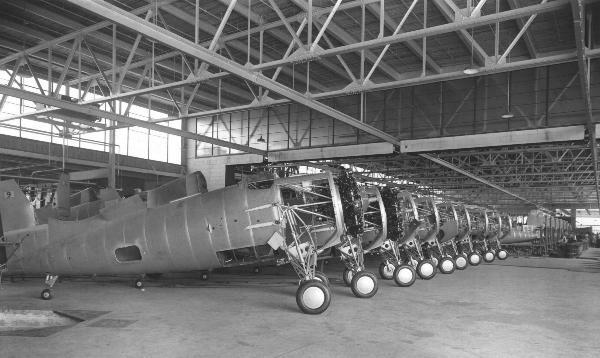 Not willing to hedge all its bets on Brewster, the US navy awarded a production contract to Grumman on August 8, 1939 for 54 Wildcats. The first aircraft was delivered in February 1940. The first XF4F-3 production contract was awarded just before the outbreak of war in Europe. Above is the production line for the F4F Wildcat in Bethpage, Long Island. 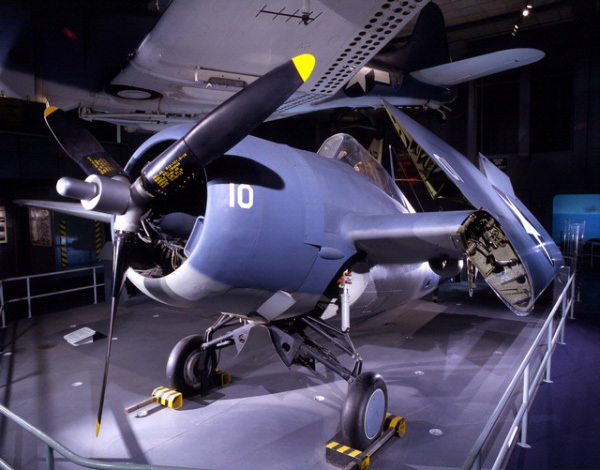 The F4F-4 was the first version of the Wildcat to feature a Grumman innovation, the Sto-Wing. The Sto-Wing used a novel approach using a compound angle folding-wing that was unique to Grumman. 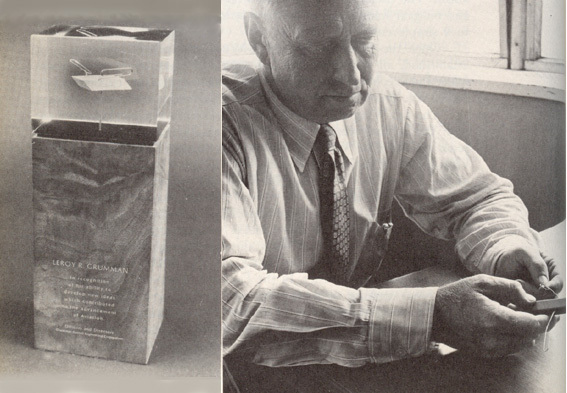 Leroy Grumman developed the idea by experimenting with a rubber eraser and a paperclip. He inserted the paperclip into the eraser as if it were the wing of an airplane until he found the correct angle where the wing would fold flat alongside the fuselage. However it took a lot more engineering to fully develop his idea to make the wing strong enough. 9 It was a successful design that was later used on the F6F Hellcat and TBF Avenger. Leroy Grumman demonstrates how he developed the idea for the Sto-Wing. The F4F-4 was the first version produced in substantial numbers and made its inaugural flight on April 14, 1941. Along with the Sto-Wing, it had an increased fuel capacity of 117 gallons, a 27 gallons reserve tank, with provisions for 50 or 58 gallon drop tanks beneath the wing on hard points. It was powered by R-1830-86 Twin Wasp engine, driving a Curtiss Electric constant-speed propeller. Armament consisted of six 0.50 caliber machine guns in the wings with 240 rounds per gun (rpg). The G-36A was not available before France had fallen to Germany and the aircraft were delivered to Britain. The armament was changed to four wing mounted 0.50 caliber machine guns, and the throttle configuration was converted back to the conventional arrangement. The Fleet Air Arm (FAA) began to receive the first of eighty Grumman fighters on July 27, 1940, which it named the Martlet I, and were delivered ahead of the F4F-3 deliveries to the US Navy. The Martlet I lacked the Sto-Wing and other equipment required for carrier operation, so it was relegated as a shore-based fighter. Martlet Is, patrolling Scapa Flow, became the first US aircraft operated by the British to shoot down a German aircraft when Squadron 804 shot down a Junkers Ju 88A on December 25, 1940, attempting to attack the Home Base Fleet. In late autumn of 1941, G-36Bs or Martlets IIs were delivered with Sto-Wings and were the first Grumman fighters to operate on British carriers. While the Martlets' performance was better than that of the British carrier-borne Sea Gladiators they were replacing, the narrow-track landing gear, however, gave their pilots many anxious moments during carrier landings. This did not prevent Martlets from being widely used by the FAA for convoy protection duties in the Atlantic and Mediterranean.10 The engine installed was the a Twin Wasp (S3C4-G, equivalent to the R-1830-90) and had it had six 0.50 caliber wing guns. Catapult spools and a larger tail wheel were installed. In November 1940, one F3F-3 was fitted with a R-1830-90 with a single-stage, two-speed supercharger and designated the XF4F-6. It began trials in Anacostia in November 1940, and attained 319 mph at 16,100 feet. The production designation was changed to F3F-3A and the first production aircraft were diverted to Greece in the spring of 1941. When the Greek resistance collapsed, they were transferred to the FAA and designated Martlets IIIs. In the United States, no Sto-Wing Wildcats had reached US Navy squadrons before the attack on Pearl Harbor, December 7, 1941. The F3F-3s from VMF-121, VMF-211 and F3F-3As of VMF-111 fixed-wing Wildcats at Pearl Harbor, were destroyed on the ground. During the Wake Island attack on December 8, 1941, eight Wildcats were destroyed on the ground and the remaining Wildcats, repaired from salvaged parts of the destroyed aircraft, fought heroically for two weeks. They broke up a number of attacks, sank one Japanese destroyer and damaged a medium transport, but despite their valiant efforts, the island finally fell to the Japanese. From that point, the Wildcat was never out of the fray, forming the fighting spearhead of the US carriers involved in the great sea battles of the Coral Sea and Midway. During February 1942, Wildcats from Task Force 8 and 17, built around the USS Enterprise and USS Yorktown attacked Japanese forces on the Marshall and Gilbert Islands. F3F-3s of VF-6 destroyed two Japanese aircraft in the first attack and Lieut. Edward H. O'Hare of VF-42 of the USS Lexington shot down five G4M1 bombers within the space of a few minutes. The F4F Wildcat was used very successfully in the battles of the Coral Sea and Midway, as well as in the operations of Guadalcanal. The F4F-4B was produced for Britain and was designated the Martlet IV. The principal difference from the US Navy version was the installation of Wright Cyclone GR-1820-G205A-3, driving a Hamilton Standard Hydromatic propeller. Performance was degraded compared to the F4F-4 with a maximum speed of 298 mph and service ceiling of 30,100 feet. Armament consisted of six Browning M-53A 0.50 inch machine guns installed in the wings. In mid-1942 Grumman was now concentrating its efforts on developing the heavier and more powerful F6F Hellcat and in early 1942, production of the F4F-4 was transferred to the Eastern Aircraft Division of General Motors, located in Linden, New Jersey. A contract was signed for 1,800 F4F-4s and designated the FM-1. This version was also delivered to Britain as the Martlet V. The main difference between the FM-1 and F4F-4 was that four 0.50 caliber wing guns were installed with 430 rpg and loaded weight was increased by 75 lb. A total of 839 FM-1s were delivered to the US Navy and USMC by late 1943. The FM-2 and Wildcat VI was developed from the XF4F-8, and first flew at Grumman Bethpage plant on November 8, 1942. (The name Martlet was abandoned in January 1944 to conform with US Navy Nomenclature.) This variant featured the Wright Cyclone R-1820-56 engine with a single-stage two-speed supercharger and new forged cylinder heads. The cylinder heads reduced the engine weight by 230 lb. and it produced 1,350 hp for takeoff. Some aircraft had water injection installed with -56W or -56 WA engines. Initially slotted flaps were installed, but these were replaced with the standard split flaps. The tail surfaces were increased to counteract the greater torque of the new more powerful engine. The empty weight was 530 lb. less than the F4F-4, which increased initial climb by nearly 1,000 ft./min and raised the service ceiling from 34,000 ft. to 36,000 ft. The main fuel tank capacity remained at 117 US gallons, but the reserve tank was eliminated. After the 2,401st FM-2 was built, fuel capacity was increased to 126 US gallons. Armament was four 0.50 caliber wing mounted machine guns. The 3,301st FM-2 and later aircraft had provisions for six 5-inch rockets under the wings. In early 1943 a contract was awarded to General Motors for 1,265 FM-2 Wildcats and 340 of this variant were delivered to the FAA and it was designated as the Wildcat VI. No less than 4,437 of this variant were delivered to the US Navy. Total production of the Wildcat, excluding prototypes, was 7,898 aircraft, with 5,927 produced by General Motors. Production ended in August 1945, with the conclusion of the war in the Pacific. two 58 gal drop tanks. machine guns, and two 100 lb (45 kg) bombs. 1. William Green. Famous Fighters of the Second World War. New York: Doubleday & Company, 1967. 236. 2. Gordon Swanborough and Peter Bowers. US Navy Aircraft since 1911. Annapolis, Maryland: Naval Institute Press, 1990. 222. 3. Bruce L. Crawford. Grumman F4F Wildcat: U.S. Navy Fighter in World War II. Aviation History. June 2006. 4. Frank L. Green. "The Grumman F4F-3 Wildcat." Aircraft in Profile, Volume 4. New York: Doubleday & Company, Inc., 1968. 3. 5. Daniel Ford. The Sorry Saga of The Brewster Buffalo. Air & Space Smithsonian. July 1996. 75. 6. Frank L. Green. 4. 7. Gordon Swanborough and Peter Bowers. 224. 9. Richard Thruelsen. The Grumman Story. New York: Praeger Publishers Inc., 1976. 125. 10. Michael J.H. Taylor and John W.R. Taylor. Encyclopedia of Aircraft. New York: G.P. Putnam's Sons, 1978. 112. 11. David Mondey. The Concise Guide to American Aircraft of World War II. New York: Smithmark Publishers, 1996. 138. Created November 6, 1997. Updated February 19, 2014.